I would like to take the opportunity to thank you all for your support with the acquisition of the new control room console. A stellar installation of the unit was completed on 2/22/17 as arranged. 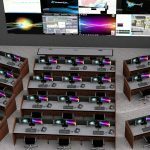 The Inracks console is central to the control of JPL’s Dynamitron Electron Accelerator, and the extra effort in designing a custom solution ideally suited for our application is greatly appreciated.